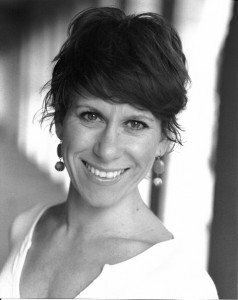 Having worked in television, theatre and radio as a child, Anna-Jane Casey made her West End debut at the age of 16 as Rumpleteazer in CATS. She followed that by performing in the original West End casts of Children of Eden, Joseph and The Technicolor Dreamcoat and Grease. Her acting career has continued to blossom and as well as leading roles on stage she has also appeared on television in Holby City, EastEnders, The Royal and Heartbeat. Anna-Jane has also performed nationally and internationally in cabaret, as well as recording for radio in the UK. Find out what Anna-Jane had to say when she recently took time out to answer some questions about herself and her career. Who inspired you to take up a career in the performing arts? I saw a performance of Swan Lake at Manchester Palace Theatre when I was aged 9 and knew I wanted to be on the stage. The next year I was! My first professional job was in Annie playing the orphan Tessie when I was 10 but I always loved watching the great musical films of the 40s, 50s and 60s. Making your West End debut at the age of 16 you played the part of Rumpleteazer in Cats. What did you enjoy most about being in the show? I loved getting into the audience and playing with people’s feet! But the best thing was being part of a company and performing with a live orchestra. I’d never seen a West End show before I got the part; and on my first day in London, the night before I started rehearsals I sat on the sound desk to watch the show, and wept all the way through, because I was so excited to be in such an amazing production. You performed in Children of Eden, Joseph and the Amazing Technicolor Dreamcoat, and Grease. What can you tell us about your most memorable moments in these shows? Joseph was the first “mega-musical” and Jason Donovan was a big star so seeing the 100s of people at the stage door every day was amazing and the same goes for Grease, as Debbie Gibson, Craig McLachlan and Shane Richie were very high profile so we did great gigs like Royal Variety Shows and lots of TV performances. We all felt like we were in a show that was very special and the Palladium and the Dominion are such enormous theatres. They were full practically every performance which is unheard of now! You had two enjoyable years in Starlight Express. What was it like being in a musical on roller-skates? Starlight is the most physically demanding yet rewarding show I have ever done. Racing around the set at 25 mph with funking loud music was so exhilarating. You really had to trust your fellow performers because one slip and you could really injure yourself. The thrill of completing the show every night without killing yourself or anyone else was a real buzz and I still skate 17 years on from doing the show! While on the national tour of West Side Story where you were playing the part of Anita, you met your husband Graham Macduff who was in the same production. What can you tell us about the show and how you managed to fit in a budding relationship at the same time as being on tour? West Side Story always has been, and still is, my favourite musical of all time and it’s been in my life for as long as I can remember. I played Anita in a local youth theatre production when I was 13, I did the song America as my song and dance at dance festivals and I already knew all the choreography before we even started rehearsals! It was the first time I felt completely “in the character” when I played Anita and I fell head over heels in love with my “Bernardo” so much so that now we have two children and have been married for 14 years! The director had to try and calm down our snogging onstage (he never succeeded) and it was such a tight company as we toured for over a year then played the West End for another year after that. In two and a half years of playing the part, I never once got bored because I knew I was playing a part that is so special and iconic. Having played the part of Frankie Frayne in On Your Toes at the Festival Hall you went on a Japanese tour with the show. What was it like touring in Japan? I’d always wanted to travel to Japan and having Adam Cooper in the show, who is a big star over there, made sure that we were all treated like mega stars! The Japanese culture is so different to ours – you could leave an open bag of gold on the front seat of your unlocked car in central Tokyo and no one would steal it, it’s just not the done thing as you would dishonour your family by taking it! I wouldn’t try that in London! We saw some fantastic sights, travelled by bullet train and ate the most incredible food and now I have lots of Japanese kanji tattoos on my body as I love the language and the people so much. You played the title role in Sweet Charity, where you were nominated by the TMA for Best Actress. The musical has been on film and stage with several leading actresses playing Charity Hope Valentine, how did you make the role your own? The production that Tim Sheader put together in Sheffield won lots of awards for its originality and innovation. The set and the lighting were incredible and the Crucible Theatre is my favourite place to perform. I tried to make my “Charity” really vulnerable and trusting so when Oscar leaves her at the end it would really break your heart as an audience member. Charity is one role I never had to force myself to cry as Neil Simon’s script is so heartbreaking and beautiful. I’d cry so hard I’d look like I’d been punched in the face on a two show day! In 2005 you won the TMA award for best performance in a musical for Mabel in Mack and Mabel at the watermill theatre. How important is it to you to be recognised for your performances and what was so special about this role? I never used to think it mattered to be awarded anything for your work… only the opinion of your family, partner and close friends should matter. But then winning the TMA changed that! Hahaha… To be nominated alongside performers you really respect is a great thrill and honour and as I’m getting older, I realise that for any organisation to recognise what you do is really special. You have performed as Velma Kelly in the musical Chicago at both the Adelphi and Cambridge Theatres. Why do you think that Chicago continues to be a success on Broadway but not in the West End? America is the birthplace and spiritual home of musical theatre… it’s held in so much higher esteem over the pond than it is here… so I’m not surprised Chicago is still playing on Broadway. Also, Broadway producers and directors don’t necessarily cast their leading actors and actresses by the level of fame they have, they cast by who is best for the job, which means a show can play for a long time without having a “star name” carrying it. You have performed in Heartbeat, EastEnders and Holby City. How does working on TV compare with the stage? Do you have a preference? Stage work is quite regimented in the fact that you have a warm-up at the same time every night, a half hour call then the show comes down around 10.15pm and you can go home. TV calls are very different – you can be in make-up at 7.00am then you may not be used for 3 hours, your scenes are dictated by how much work the lighting/camera/sound/continuity departments need to do and you can be at the studio all day to be used for 20 minutes! It’s a very different discipline than theatre and I’m terrible at waiting around, as I’m a complete control freak, so although it’s great to be involved in television productions, getting an immediate reaction from a live audience then getting home at a regular time, suits me better! You are a successful cabaret artist. How important is it for you to perform cabaret, away from the regular commitment of an 8-shows-a-week musical? I played a lot of cabaret at the Savoy Hotel during 2010/11 and it really made me learn how to work an audience who aren’t necessarily coming to listen to “Anna-Jane Casey”, they were just listening to a “performer.” It’s a great skill to be able to make people invest their time and attention on you and once you have them on your side, it feels great! I now play my ukulele in my cabarets and having that skill really makes people respect you as a musician and listen so much more. Also, I always say, unless you are Liza Minnelli or Chita Rivera, no one wants to hear stories about when you were in this show or played that part, it’s just not interesting so I try to make my cabaret audiences laugh and feel like a friend so I choose songs that are fun, easy or exciting to listen to. You are playing the part of the Lady of the Lake in Spamalot at the Playhouse Theatre. What can you tell us about the character and how she fits into the storyline? The Lady is an amalgam of all the divas you have ever known like Minnelli/Streisand/Bassey and is a mystical figure who gave King Arthur his sword “Excalibur” (the only sword with its own name!!) she helps the knights and especially King Arthur, on his quest to find the Holy Grail. What attracted you most to the role of the Lady of the Lake? I’ve always wanted to sing the role and first auditioned for it in the West End in 2007 but wasn’t lucky that time. I enjoy opening my trap and singing those great songs like “Find Your Grail” and “Song That Goes Like This”. Also my gorgeous hubby is in the show too and although we don’t really have much interaction in the production (he marries Prince Herbert and not me), there’s lots of snogging backstage!! How do you both feel about this reunion on stage some fifteen years after your first encounter? Most people say they couldn’t bear to work alongside their partner but we are thrilled as it means we can get to be “Gray and AJ” again for a few hours every day and not just “Daddy and Mummy”, hahaha. Why should everyone come along to see Spamalot and not some other West End show? It’s absolutely hilarious for a start and everyone loves a good laugh and the cast are phenomenally talented. Stephen Tompkinson is a great King Arthur and Jon Robyns, Adam Ellis, Robin Armstrong and Rob Delaney are all fantastic comic actors. Oh and Graham Macduff looks great in his sequined jockstrap! Your sister Natalie has previously played several comedy roles. 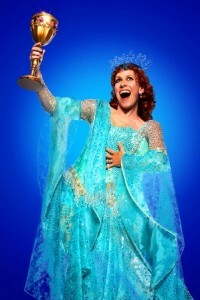 Following Spamalot will we see you challenging her for this type of role in the future? Ha! Natalie is the funniest woman I know but she says I’m the second funniest so maybe we can do a Channel 4 sitcom together! What do you like most about the humour of Monty Python? It’s intrinsically British and it’s been part of my life forever as my parents are big Python fans so the Flying Circus was always on in our house when I was a kid. It’s the silliness and surrealism that I love. What else have you planned for 2012 and beyond? I’m doing some fantastic concerts at the Royal Albert Hall in December and as well as 8 shows a week of Spamalot, having a 6-year-old and a 6-month-old daughter keeps me busy! I love to run (doesn’t sound very chilled I know) and I’m running the Berlin Marathon in September 2013 so I’ll be training for that when I can. I also love making an “AJ shaped” dent in my sofa while drinking Earl Grey tea and eating homemade choc chip cookies! You have two young daughters. How do you make sure that you have enough time for your family as well as being on stage? Once you have children, your life becomes a military operation and every woman should be told that there’s never a lie-in for the rest of your life at their first antenatal appointment! You just have to learn to exist on about 5 hours sleep and plan everything to the absolute minute! Keep smiling because if you don’t, the wrinkles on your face will just make you look dreadful… they may as well be laughter lines rather than worry ones!